Welcome to Hope and Understanding! Have faith in the fact that you have given your life to God, and He is faithful to direct it. If, indeed, you have done so. Hope leads to faith, and faith gives chance to love. Love is the prerequisite to accessing the gently unconquerable power of God. This power heals and transforms. It depends on no one but you - in your willingness to accept and test God's purpose for you in faith. It does not require a perfect attempt, for the power of understanding, strength and love grows by means of exercise of what is known now. Failure is impossible. Evil is always defeated. Goodness reigns in happiness forever after, and though there are sacrifices, the happiness part includes life beyond our present mortality. No, I am not referring to children's fairy tales but to the sublime peace of God and its power in truth found hidden in small miracles, for it is the small miracles of daily life that prepare us for the big events, the poignant trials leading to our ultimate salvation. They are the forerunners of eternal life with God, which is the great hope of the Christian faith in Jesus’ resurrection from the dead. For centuries, great writers of children's stories have known the power of these truths. In the realm of modern media Walt Disney took his understanding of hope and love in joyous fun to build an economic empire, which yet survives on his fading vision. Although his genuine wonder has since been too often replaced by enjoyable yet some how more shallow and commodified imitations, echoes of Walt's guiding insight, imagination and enthusiastic happiness still linger and deliver competitive popular entertainment through his corporate descendants. Hope is something I have often needed, and understanding is what I have unwaveringly sought. This book is an effort to share in reflection some of what I have discovered. Sometimes these in­sights have come through great personal suffering. Often it has come from observing the even greater suffering of others. Often I have felt humanly alone, but more objectively, I am thankful for the help I've received from more than a few men and women of various faiths - including some unsure about God but empowered by His caring compassion nonetheless. Do you wish the childhood dreams of happy endings were indeed true? Do you feel alone in this world? Perhaps frustrated, empty, or pointless? If so, you are caught in a deceit I once knew well. You are not unusual or unique in such feelings. Humanity has been stalked by them for millennia. Prophets of ancient Israel, modern urban street people, and the mass media denizens of American talk shows - all have been witnesses to the fear and emptiness of loneliness. This book is about the Mission of ONE. It is about overcoming the lonely sorrows of personal existence through the incorporation of the divine power to make a positive difference in this world. It is about discovering some sense of your divine purpose for being alive. No, I am not going to tell you what it is, but I hope to lead you towards the proper mental and spiritual envi­ronment for its discovery. This approach means embarking on an uncharted journey towards God's purpose for you in this age. By necessity each of us must walk this path individually. The “individually” part is what makes it seem like we are alone sometimes, but in truth we never are. It's just that we are senseless to His presence. I hope to show you some ways of developing spiri­tual perception. What is remarkable, however, is that being ONE on a mission does not mandate being alone as in isolated. Understanding one's mission in life opens the door to ONEness and fellowship with others along our journey in life to meet the once and ever Creator and future Judge of all mankind. Perhaps you will enlist and even serve for years without any dramatic apocalypse of enlightening knowledge - the kind which envelopes you with an explicitly definitive revelation regarding your personal purpose and role. Then again, maybe you will have such a dawning insight. And I certainly can't promise even a fleeting glimpse of the Holy Awesome ONE, but hopefully you will grow to see God's hand at work daily in your life and in the lives of others - in at least some of its disguises. In short “so shall you taste indeed that life is good”. Mission awareness also opens Pandora's proverbial Box of the world's troubles to your mental and emotional awareness. It will create an enlarged desire for healing the harmed or to defeat the demonic despot despisers of humankind. Unfortunately, it is impossible to know goodness without also coming to know evil - especially the evil that lurks within each of us. Therefore, I cannot escape from an honest obligation to define and describe the nature of evil and how it can be defeated, but I will avoid the great mistake of dwelling on it with focused fas­cination. Evil is real. It hurts. It tortures. If it can capture the attention of the mind, evil de­stroys human identity and being via the vacuous emptiness of futile self opposition to God and the natural order of His Creation. Linked with power, evil wracks the world with environmen­tally dimensioned chaos dealing death to man, beast, and plant. If we do not face our imperfect human nature with open vulnerability, with suffering we shall serve our own twisted expressions of who we are. Besides harming others, we are doomed to enduring an empty to dull life guaran­teed to be rewarded with oblivion's death. While there are almost always risks in any bona fide healing therapy, ONE must be prepared and willing to take them if (s)he is to enter into the fullness of God's grace - the mystery of His pur­pose for human life. This is the better way. The psychological and emotional wounds we receive in this life require healing from Godly wholeness, the peace that passes understanding. The natu­ral response of man is to ease our own pain by injuring others. Jesus’ way is to break the chain of guilt and reprisal by taking our personal pain upon Himself through our prayer in faith and thus enable us to forgive and forge healing love. This is the way to peace and personal fulfill­ment in this life. Being on a Mission of ONE implies the power of a focused, collective unity. Indeed God is a conscious righteousness, an e pluribus Unum of collective unity, the fullness of grace founded in forgiveness. The Bible contrasts God with Satan, the Adversary, a fallen angelic void, which mechanically seeks division and singular self-rightness which is energized by feeding off the condemnation and destruction of others. Through small degrees of deceit and fear, evil insidi­ously leads us to withdraw within, to separate ourselves from our fellows and to attack whom­ever is different. I feel it important to add that the unity I propose is a spiritual ONE, not a universally political or social ONE. It is conceived of as a more complete expression of each particular identity secure in itself as a mortal manifestation of the greatness of God. A movement to organizational or politi­cal union may or may not be good. Sometimes maintaining organizational boundaries or politi­cal borders may accomplish more than a contrived or superficial oneness. Like Robert Frost wrote, “Good fences make good neighbors.” The same principle should be applied to people where the fences are a person's inherited/accepted cultural constraints. I enjoy this world of diverse expressions and traditions to draw from, founded on and empowered by the ONE God, revealed in Christians and presented to mankind in three faces or personae. Hopefully, the result of your time spent with me through reading and reflection will be that you will come to personally experience some sense that the human condition is a deceitfully ephem­eral existence apart from the reality of God. I hope to help you to recognize the vital choices in life, and so seeing to choose good ones for yourself instead of evil's destructive lies. I encourage you to choose God's im­mortal creation of who you truly are in Christ instead of Satan's siren song of lies, his conditioned offer of temporary power for a false eternity, which is actually the empty oblivion of an imploding self. Satan would annihilate by enabling a striving to preserve mortally alive the natural ego we are born with. In this book, I hope to reveal to you how God is the eternal presence of purposed power in the universe, the fullness probably best referred to as righteous love. My minimal hope for this book is to make a positive difference myself in the lives of at least a few others and through them, a small nudge towards the improved civility and care of human so­ciety as a whole. Oh yes, it might also be nice to make a little money from sales, but there are far easier ways to make money than to write a book. That is not my motivation. I have spent untold hours in writing this modest book. In it you will discover the keys to unleashing the ultimate power of God in your life and through you to others. Our success is guaranteed because Jesus will unleash God’s pure cleansing power of love and justice upon the world’s social and spiritual institutions of evil at His return to this earth at the end of what is popularly called the Apocalypse or Great Tribulation of the Bible. The establishment of the Kingdom of God on earth will eliminate the present structural obstacles presented by the world’s socioeconomic and political systems as well as eliminate the dark spiritual power structure behind them. I believe that life is a dynamic balance between personal worth and service to others as a channel of God's grace. Everyday life should be spiritually founded and propelled through the uncharted universe of the immediate and recent now. By "recent now" I relate the recent past and impend­ing future to the present out of practical consideration for others. Suspension in the mantras of timelessness does not define dynamic living. Each person has a worth incalculable that is largely self-determined. There is no wrong time to reevaluate that worth. The Mission of One implies practical application of its principles begin­ning in whatever state ONE finds himself or herself in at the time of acceptance. It is both neces­sary to accept the facts of the present as well as to be willing to embrace a new mode of life as a consequence of growth through troubles and service. My goal is not to create a bunch of judging, self-righteous zealots pursuing personal agendas in the name of God. Calling themselves "Christian", many such zealots claimed to act in God's name and by His authority in the proclaimed interests of truth and salvation. The fruits of such declare otherwise. The world has already suffered for hundreds of years at the hands of such. Although God is bigger than religion, people are not. Religious practice and diversity is a human necessity and healthy to the formation of broad, creative Godly expression in reflection of His loving universality. 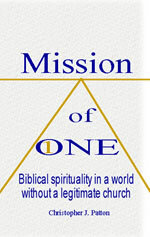 The Mission of One is about how each person can make a blessed difference in this world. This blessed transformation is made possible by the fairly consistent unleashing of the unlimited power of purposed love that underlies our universe. It is a potentially unlimited power of goodness and love available to each and everyone willing to make the commitment to personal change. While the power of God is unlimited, it is not under the control of any single person, group of persons or human organization. The miracle lies in testimony that the honest exercise of Godly power does not benefit the one who wields it any more than the one who receives its working. Both are viably blessed by God's presence in power. It is a "blessed difference" because it is a difference that is bound within a promised eternity: impact made and effected by the ONE God who may become divinely dy­namic within a person's fallible fleshly body. By "ultimate power" I intend the spiritual power, which is sourced in God's absolute forgiveness of incongruous and unpreventable human imperfection. Such power yields balanced, healthy, happy people secure in an identity resurrected in Jesus Christ as ONE's personal savior. As its natural fruit, such an identity yields creative growth and moral behavior in this life as well as the earnest beginnings of eternity to be continued in the next. Whereas man is born to die, God lives to be born where the occasion of submitted human voli­tion admits His presence by the Spirit through the sacrifice of His Son, Jesus. Access to and ex­perience of God's power lies in living the understanding that the unity of God is an indivisible collective. Because of natural human limitations, the Mission of One will fail without the fellowship support of such a corporate unity, for it is by the experience of God's grace towards us through others that spiritual reality becomes effectual. Otherwise, ONE's "faith" is restricted to a self-delusional emotion, but neither does fellowship equate with church membership – or even regular attendance. Proof that an impactful exercise of the power of Godly love is attainable lies in the history and heritage of the early congregations or churches of Yeshua the Messiah, the name by which Jesus Christ has been and is known in Israel. The stories from that time are many and once were well known. The impact of the life of Jesus changed human expectations and experience to the point of overturning and converting empires with truth, love, decency, forgiveness and peace. Therefore, I do not seek to compete with any church or mission group, nor does this book pro­pose the formation of any new organization or formal legal structure. It does not seek leaders, for ONE already exists, the Son of God. Rather, it is to help us all to learn that we are not separate although individual. Our individuality often makes us feel alone - especially so in the midst of any trial, uncertainty or conflict. This book is a studied hypothesis regarding the rediscovery and re­lease of God's ultimate and consummate power of love through mystical fellowship in order to begin effective healing change in our western civilization and the world as a whole. Personal risk is required to participate in the preparation and search for this power. As in every circumstance requiring faith and trust, mistakes will be made. Mystical fellowship in human community does not take away trials and troubles, but it does mediate God's comfort and care. It's purpose is not to provide opportunity for material support but to expand or deepen under­standing and strength. Some who try to enter this way may be temporarily hurt, but I hope that the result of my effort will be more saints living outwardly normal and inwardly blessed lives. The Good Samaritan did not bring the injured traveler to his own home to support him for the rest of his life. He offered the injured man what he was able to give: practical comfort and paid care at the inn. He gave what was necessary for the incidence, and both moved on with their seemingly uncharted lives. He had faith that God would provide the rest of the injured man's needs in His wisdom way and manner. Assumed is that once home, the traveler would find sup­port from family and his other circles of community to continue on. If even ONE percent of the planet's population truly learns to live by the unleashed power of God's Holy Spirit, then the modern world will be upset, too. Without such constructive change misery is doomed to increase and general human worth to decline. The vast majority will continue to be uselessly sacrificed to the various few who temporarily ride the crest of unbridled capitalism in a socioeconomic version of the survival of the fittest. My purpose is to share the beginnings of answers to these questions in these pages. Although I believe that these answers are real, I honestly won't know how real until the Mission of One is fully underway. That is the limitation of any proposed approach to solving broad social inadequacies. I may not see definitive results in my lifetime; however, I do hope for much better than that. Through the ups and downs of my own life, I have struggled to live decently and rightly, only to fail miserably: thereby, I am myself totally unworthy. Because I am so unworthy, it has been possible for me to accept in grace a limited but profoundly liberating understanding of the depths of the ONE GOD's mercy in His Savior Son, and so I have experienced brief episodes that revealed glimpses of the pure reality of God. My personal experience gave me the insight that God's omnipotence is rooted in His unlimited capacity to forgive the truly repentant. I also write this book in the hope of expanding my personal experience of God's power in mani­fest relevance by sharing the insights given me with a world in need. God is real, and very much alive. God alone is eternal - living beyond the speed of light, so that He is also called Light. In this independence of existence, God is unassailable, untouchable by mortals, except as He wills, but mortals are not similarly isolated from their immortal Creator. The anciently revealed God of the Hebrews claims over all of mankind His responsibility and right for a monopoly on forgive­ness and judgment. It is His right as Creator, and it is the essential source of His omnipotence in the affairs of men.